My Chinese genealogy adventures (of course). Resources I like, lessons I am learning, and appreciating our collective roots along the way. It took me a while to understand and appreciate my maternal family’s amazing and rich history as Chinese and Chinese Americans, and it was almost too late when I finally started digging in to it. I’ll share how I did it, who helped me, and what I’m working on to dig further in to my and other folks’ family histories. Today, I shared a site I’ve always enjoyed with a genealogy buddy who I figured already knew about it, but turns out it was new for him. FindaGrave.com is a virtual cemetery. I know, sounds morbid. No, you don’t virtually bury anyone there; instead it’s a FREE online database of currently and historically interred individuals buried around the world. In genealogy research, there can often be very little left to find about a person who lived lifetimes before us, and often the last remnant of their lives are their graves. Chinese graves and headstones specifically can provide the living with a wealth of knowledge about the interred individuals. Often they provide multiple Chinese names they’ve been known by, their ancestral village name, and photos of the deceased. It’s almost like a one-stop-shop for information, as long as you can find that headstone. And as long as you can decipher all that information in Chinese. Individuals can upload information about their own ancestors, and some people have taken it upon themselves to capture information about entire cemeteries to share on the site. 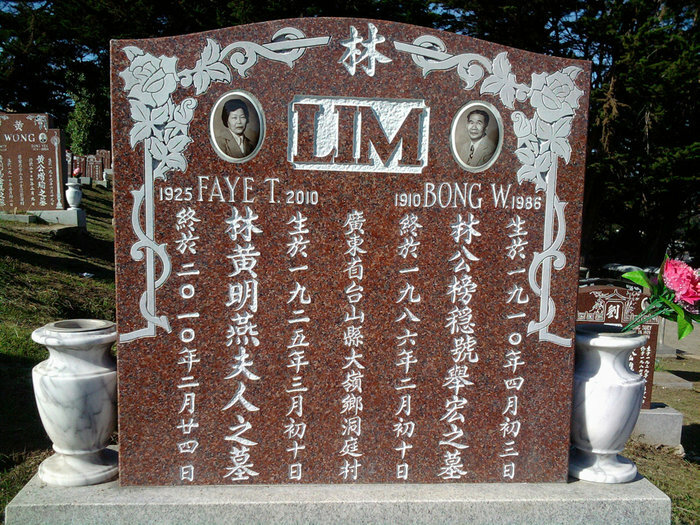 Here is my grandmother’s personal listing: http://www.findagrave.com/cgi-bin/fg.cgi?page=gr&GSln=lim&GSfn=faye&GSbyrel=all&GSdyrel=all&GSob=n&GRid=63022870&df=all&. You may notice my grandfather is linked to her page if you click the name right under “spouse”. I’ve added information about both of them on these pages in addition to the basics. Next time, I’ll explain how to decode all the writing on Chinese headstones.